I launched my kickstarter yesterday and this morning I awoke to discover it was 100% funded. This is great news so I shall now be making a bulk batch of Fractal Puzzles for people. There's still lots of time to get involved though, I'm even open to stretch goal suggestions if anyone has any ideas. 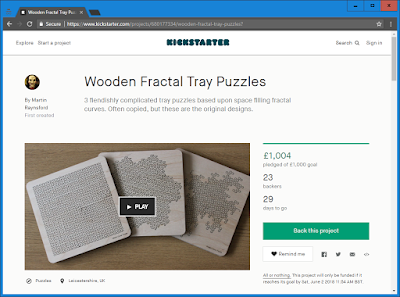 I have just launched a Kickstarter Project for the fractal tray puzzles I made many moons ago. These tricky little puzzles are going to be made of BR Grade Birch Plywood and sanded to a fine finish before polishing with Danish oil so they'll look really good. I'm pleased to be offering them in this high quality finish and fingers crossed the campaign will be successful. 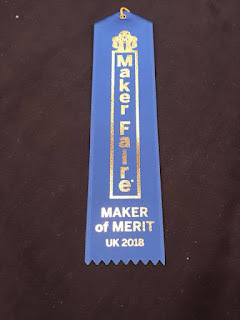 I don't mind admitting I was a little bit unsure about Maker Faire this year. I felt like it came around really quickly and I hadn't actually made that many new things since the previous year. I don't like showing the same stuff off again so I had to wrack my brains about something new to take. Clearly I was having a dumb moment and I ended up taking Dawn to the Faire and a selection of the cakes we've been working on. I needn't have worried Dawns work is fairly unique in maker circles and throwing in some moving designs was enough to gain a blue ribbon. It was great meeting so many blog readers and old friends, thank you all for coming over to say hi. I shall endeavour to post more of the things I'm actually making as soon as I'm able to rather than leaving it all for months. Hi to all the new people just tuning in, hope you don't get too lost down the rabbit hole of previous posts (check out the gallery links at the top of the page).